Disney Super Freak: Best Souvenirs Ever!! A Blog for all things about Disney Travel. Hints, Tips, Information, Ideas, Thoughts, and above all...Magic! So, I'm that person who collects decorative shot glasses. I've got shot glasses from almost every place I've been in my adult life, including most of the casino's on the Las Vegas Strip. :) That being said, most people are constantly looking for that special souvenir, whether it's just for a memory, or to display that you've been somewhere, or even just as a keepsake for later on in life, looking in the vacation boxes to reminisce. Our family has found what we think is possibly the best souvenir ever, and it costs pennies....litterally!! 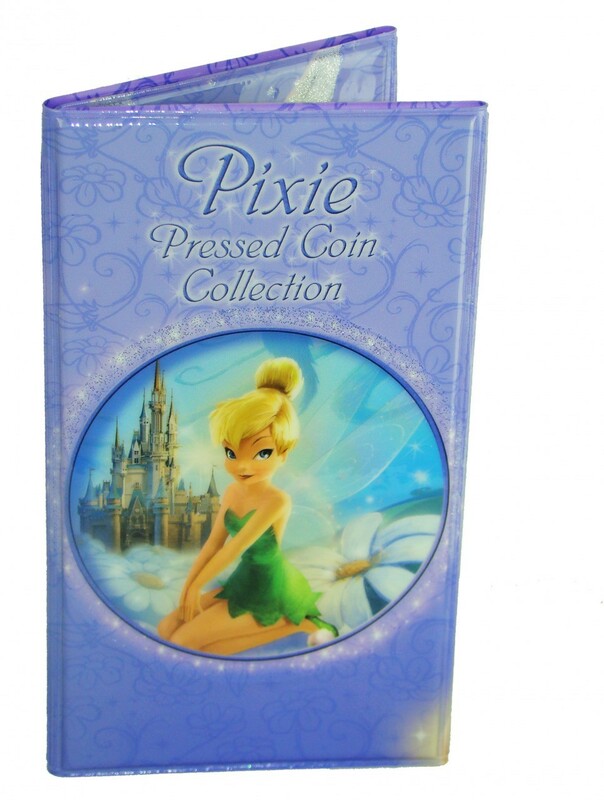 We've fallen in love with Pressed Coin, specifically, Pressed Pennies from Disney. Well, we actually get the pennies everywhere we go, from amusement parks to museums, but Disney is where we cut our teeth in this whole process. On our first trip with our princess, we let her press a few pennies, just to have her create some buy-in and ownership in the memories we were making. 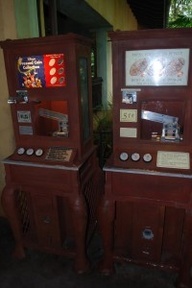 Unlike many places, a majority of the pressed coin machines in Disney World are machines that have graphic buttons that indicate the pressed penny that will be made, so all we had to do for our princess was allow her to choose the picture she wanted...more to the point, which character she would like on the coin. She'd reach out of the stroller, press the button (after we've put the money in) and out would pop the penny. We didn't think much of it until we got home and realized that we made nearly 20 pennies on that trip! That got me thinking...How many pressed pennies were there at Walt Disney World? Well, I found out...and I've never been able to vacation to Disney normally again!! I found a site called Press Coins (www.Presscoins.com), the Unofficial Walt Disney World guide to Pressed Coins. They have lists, locations, excel files, descriptions, codes...basically everything a treasure hunter would want in their effort to find every pressed coin in the world! A quick point of clarification...I've been mentioning pressed pennies for much of this post, but there are machines that will press nickles, dimes, and quarters as well. It's up to you how deep you delve into this obsession...I'm in REALLY deep! Using Press Coins, I've been able to track which coins we've pressed, which characters we've gotten, and which numbers we've gotten in various series (did I mention that there were series? Oh well...and deeper I go!). I even bring the lists into the park and, while I'm waiting for my queen and my princess on rides (I'm not a big ride person...motion sickness, you know), I'll go and seek out certain coins that are missing from our collection. To date, I believe we have about 250 coins from Walt Disney World, and they change and add more every year. I'm both excited and scared to go back soon, as we've not been back since winter of 2011, to see all the new designs and machines throughout the parks and resorts. The best thing about pressed coins as souvenirs is the cost. Where else can you get a lasting memory for a whopping $0.51 each!! That right...two little quarters and 1 penny is all it costs to get your prince or princess a neat souvenir that they make and choose themselves. (The quarters cost $1.25, and the dimes and nickles are each $0.75 plus the pressing coin, where you can find the machines) We truly do love this hobby. Planning for the coin pressing isn't as hard as you'd think. Many place on the net will provide you with coin tube, or ideas for ways to keep money handy as you tour the places where pressed coins are available. 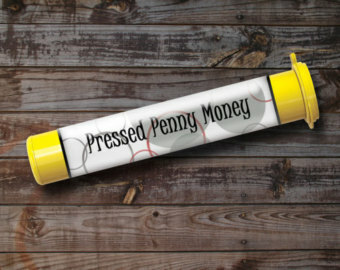 Our favorite way to keep the coins handy is an empty film canister (I know...who uses film any more) or, even better, is an empty M&M Mini's tube (you know...the yellow flip top tubes??). We even take it one step further and for packing purposes, we put all our quarters into cardboard tubes that used to contain those glow sticks that make the bracelets and necklaces. It's the perfect size for the quarters, and it keeps them from rolling all over your luggage. Public service announcement number 2!! If you are traveling by air, please be aware that a large stack of coins will throw up some red flags in both your carry on as well as your checked baggage as the X-ray machine can't see through...it just looks like a solid piece of metal. Be prepared to explain your obsession with pressed coins to the TSA agent, or be prepared for your checked bags to be searched. For our times in the park, we take the M&M's tube and alternate the coins in the tube, starting with 2 quarters, followed by a penny, then 2 quarters, then a penny, etc. until the tube is filled. I also bring another tube each of extra pennies and extra quarters, just in case. After you press each coin, you can either just hang on to the coins either in a bag (we use a zip top baggie) or you can purchase a coin album anywhere in the parks. They have multiple designs, many colors, and there are places in the album for you to put the pennies as well as the quarters you press. How deep you go with this is completely up to you, and how obsessed you get. I'm pretty obsessed. I've even trained my princess to be as obsessed as I am...so much so that she can spot a penny machine anywhere we go from about 50 yards! Joking aside, I really think that pressed coins are definitely a great way to have some souvenirs of your magical vacation without spending an arm and a leg. Until next time, have a Magical Day, and always be looking for your Enchantment Destinations!!! Character Dining...Twice the Disney Magic!! All Content is for informational purposes only. All Rights Reserved by Author. Travel theme. Powered by Blogger.